Thermo King West Parking Lot, 314 W 90th St. 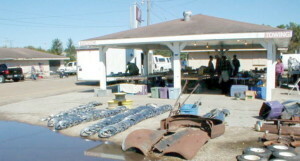 This is for Racers and all Car Buffs Clean out that garage and bring it all to the Swap Meet! 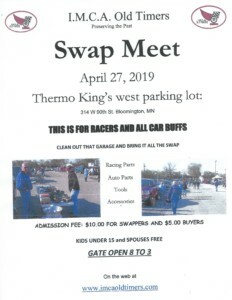 Racing Parts Auto Parts Tools Accessories Admission Fee: $10,00 for Swappers, and $5.00 for Buyers Kids under 15 and Spouses free PRINT FLYER HERE! 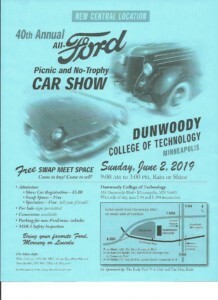 46th Annual MSRA “BACK TO THE 50’s” WE’RE COUNTING DOWN!! 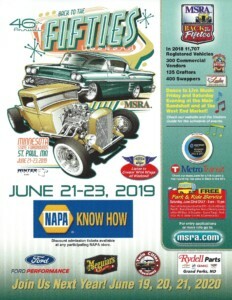 to the 46th annual “Back to the 50’s” June 21 – 23, 2019 MN State Fairgrounds, St. Paul, MN Approximately 12,000 registered vehicles, 300+ Commercial Vendors, 135+ Crafters and 400+ Swappers. You DO NOT want to miss this event!!!! 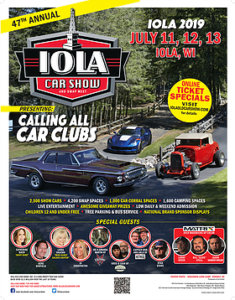 O'Reilly Auto Parts Street Machine Summer Nationals Coming to the Minnesota State Fairgrounds July 19-21, 2019. Pre-registrations through July 12th is only $50 and will be $65 the day of event! 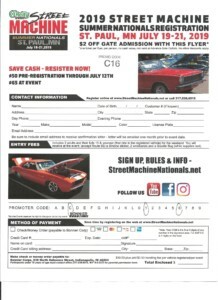 Sign up, Rules and Information at www.streetmachinenationals.net PRINT FLYER HERE AND PRESENT AT THE GATE FOR $2 OFF GATE ADMISSION!!!!! 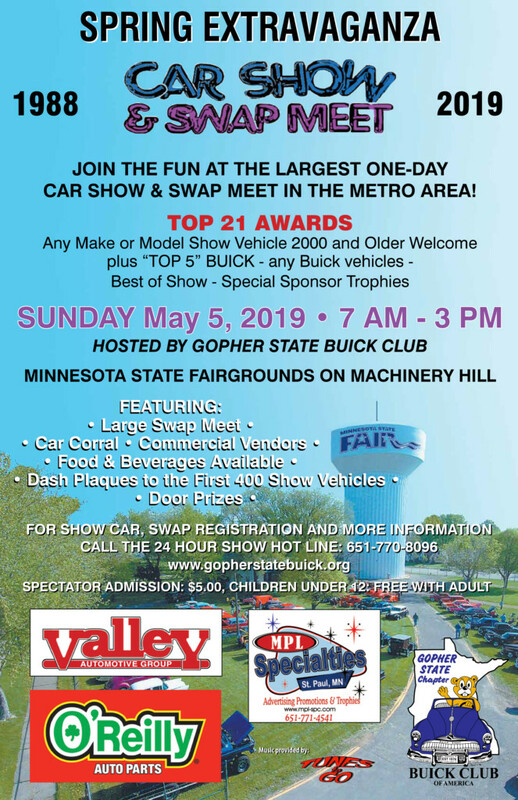 43rd Oldsmobile State Show Car Show and Swap Meet Hosted by the Minnesota Olds Club. 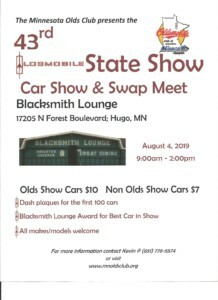 Takes place August 4, 2019, at 9:00am - 2:00pm, at the Blacksmith Lounge located at 17205 North Forest Boulevard, Hugo, MN. 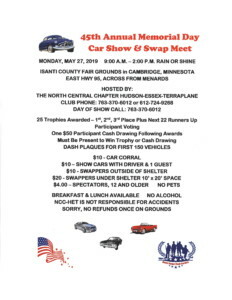 Olds Show Cars $10 Non-Olds Show Cars $7 Dash Plaques for the first 100 cars. Blacksmith Lounge Award for Best Car in Show. ALL MAKES/MODELS WELCOME!!!! 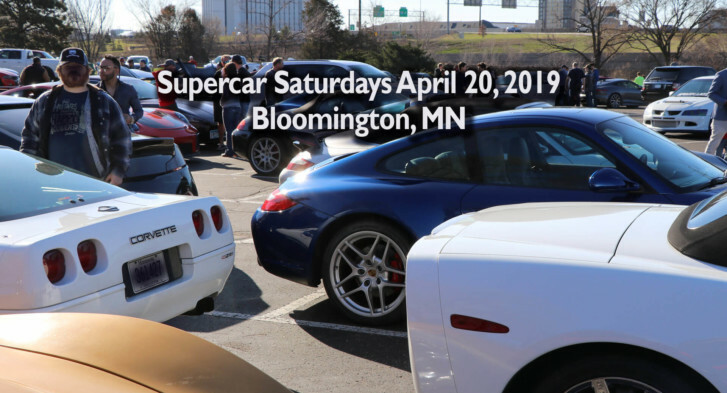 For more information contact Kevin at (651) 776-5574 or visit www.mnoldsclub.org. PRINT FLYER HERE! PRINT REGISTRATION HERE!